Things don't always go well for the Starks. They've suffered more than their share of separation, treachery, injury, tragedy, and death, but even so, the Starks go on. 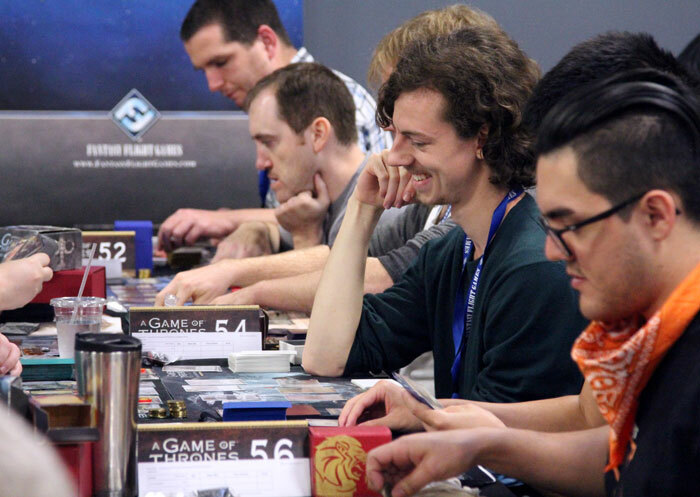 In fact, the 2018 A Game of Thrones: The Card Game World Championships saw the Starks rise to prominence once again. It was House Martell, commanded by Lennart Paga, who won the event, but they only won with the support of the Starks at their back. Banner of the Wolf may have not have been among the tournament's most popular agendas, but it was easily among the most influential as three of the Top 16 players relied upon the Starks for support. And, now, after the Starks have charged back to strength at the very highest levels of play, we're happy to root for them once again with the prizes from the 2018 Season Four Tournament Kit! While your local tournament organizer can use the contents of any A Game of Thrones: The Card Game Tournament Kit to support whatever type of event is best for your community—whether a demonstration, new player night, or casual league—they are most commonly awarded as the prizes at the game's local March to Battle tournaments. Each March to Battle tournament immerses competitors in the Seven Kingdoms and their battles, intrigues, and fleeting alliances for three rounds of Swiss play. The format is short enough for a weeknight… but long enough to see the Starks attacked by the Lannisters, betrayed by their bannermen, raided by the Greyjoys, and resurgent by the end! Accordingly, the prizes from the A Game of Thrones: The Card Game 2018 Season Four Tournament Kit depict the Starks as they both rise and fall. 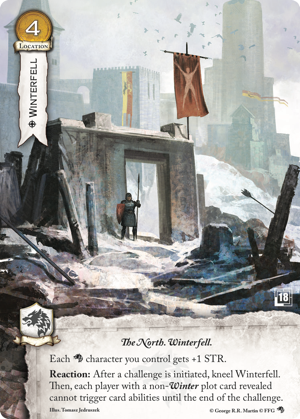 The Tournament Kit contains seventeen copies of an alternate art version of Winterfell, illustrated by Tomasz Jedruszek. Here, Winterfell has been seized not once, but twice. The walls have fallen, and the Flayed Man of House Bolton flies above the gate. One copy of this card is intended for the tournament organizer to keep or distribute as he or she sees fit; the other sixteen are to be awarded to participants in the season's Organized Play. At a March to Battle tournament, the Top 16 players should each receive a copy. 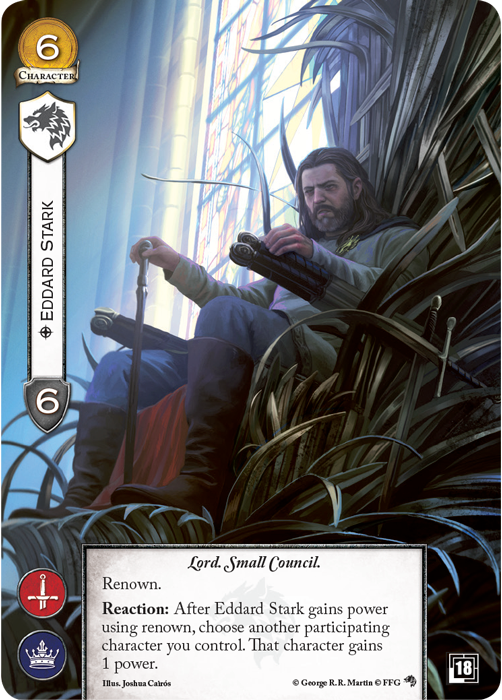 From the alternate art card that sees the Stark family home lying in ruins, we turn to an alternate art card that envisions the head of the Stark family positioned as the second most powerful man in all of Westeros. Illustrated by Joshua Cairós, the card depicts Eddard Stark seated atop the Iron Throne, attending to matters as the Hand of the King. There are three copies of this card in each 2018 Season Four Tournament Kit. One is again intended for the tournament organizer, and the other two are awarded as elite prizes. At a March to Battle tournament, these elite prizes are awarded to the top participants in the order of their finish, with each choosing to claim either one copy of this alternate art card or one set of the tokens awarded as the other elite prize. 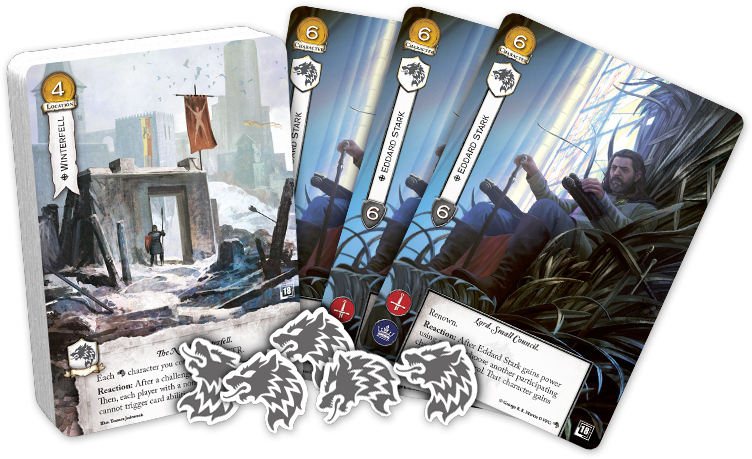 The 2018 Season Four Tournament Kit comes with three sets of Stark tokens—each shaped like a head of the House's emblematic direwolf, with gray paint on white acrylic. Each set contains five tokens, meaning if you truly want to help the Starks rise from the ashes to reclaim the North, you'll want to place well in your Season Four events! Talk to your local retailer about getting involved with 2018 Season Four Organized Play for A Game of Thrones: The Card Game!